Send Us YOUR SwellColors Review! We’d love to hear from you! Check out our customer’s testimonials below! What a great experience Tuesday - so glad I found your class! Thanks again! I'll be back next summer ⛱! We visited Swell Colors for a Third Thursday event and loved it. We came back as a family to do a larger project a few days later. My mom and son both came along and we created pieces that we fell in love with. Great energy in the studio. Beautiful selection. Ceire is very helpful & informative & friendly. Will definitely return. With help, my kids made two mosaics and they came out more beautiful than we could have imagined! I have to try to decide on what I want to order - one piece is more beautiful than another! Also impressed with all your packaging. Loved it all, my Jersey Shore note, your pc w/ so nice message, the box, the ribbon (which I used), the efficiency. GO GIRL! 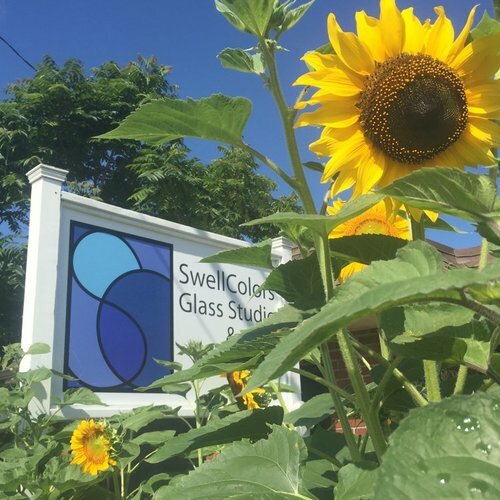 Always a great experience at swell colors! Had a wonderful experience making glass beads! Thank you Mary! Thanks again, Mary, for the amazing job on the Spring Lake Beach Babies! The ladies at our retreat LOVED them. The necklaces had exactly the impact that I had hoped for and will be a beautiful memory of the work that we did together. How awesome that you can integrate something as "common" as sand with something as beautiful as Murano glass to create a meaningful and personal work of art that each one of us will cherish. Sunrise Session looks to beautiful in my family room. Can't believe it waited for me for three years! As my oldest son rises to the new adventures of college, it is appropriate that this piece encompasses his roots, waves to energize his efforts and send him forth and our magnificent sun that warms us all wherever we are...even Boston winters!! Can't wait to give Kristen "Winter Sol"...she will equally celebrate your beautiful creation. It was so lovely to explore every last piece of color and glass in your studio...so thrilled these pieces chose me! Gabe also found a bright spot in his room for the glass dolphin he chose. Hope you find some sunny inspiration today. I wanted to let you know that the pendant came yesterday and it is perfect! Thanks so much for working with us on this. She will certainly treasure it. (I think she has been wearing the other one almost every day since she got it). I wanted to let you know that the immigration is complete for the mosaic fish to its new home in Canada! He loves it, and rightfully so. I had a blast! Thanks! Love coming here and seeing Mary's work as well as the other talented artists she features. Everything is unique and beautiful. Amazing products and the most helpful and friendly staff. WOW!!! Mary – I LOVE LOVE LOVE my present!!!! Thank you SO VERY MUCH for the incredibly gorgeous dish and awesome LBI ornament!! You MADE my year! I can not tell you how important you are to me and how much I genuinely appreciate YOU! Had a great time with my niece today making christmas ornaments!! We both really enjoyed our time there!!! The best place in the world and the best artist! Just received my absolutely lovely lovely rings...which fit perfectly!! Thank you so very much! I look forward to wearing this work of art where your creativity and talent will be on display. And, how fun it will be to share the wonderful story of its creation when asked, "Where did you get beautiful that necklace?" I just picked up the beautiful gift that you made for my mom. It is absolutely amazing. I picked up information on classes and will surely be seeing you soon. Have a great Christmas and all the best to you and your family. Ps the lady that helped me was very insightful and very friendly!! About a custom sea glass jewelry order: She LOVED the necklace! Thank you!!!!! Thank you for hanging in there with me and making it happen. A very special gift. The pieces are so beautiful and I love them. I get so many compliments. I treasure them.